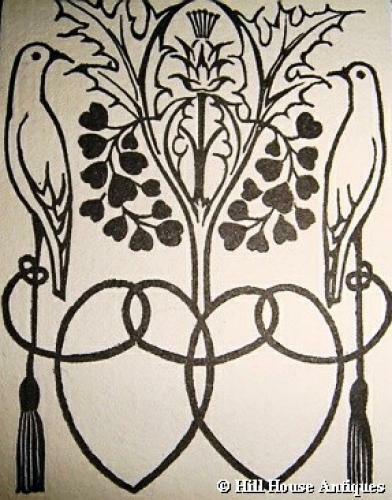 A rare original bookplate designed by CFA Voysey for James Morton (of the Morton textile family); of Beatrice Emily (his wife) and himself, 1901. Bookplate itself approx 12.5 cms by 6 cms. The joint bookplate of Beatrice Emily (Fagan) and James Morton is illustrated in the book we also have, "Three Generations in Family Textile Firm" by Jocelyn Morton, p 178. As Beatrice Emily was of Irish descent and James Morton hailed from Scotland, Voysey (who was also a family friend) illustrates this with both the shamrock and thistle growing together, while birds stand sentry over the united hearts. MH Baillie Scott and CFA Voysey, The Lake District & Beyond: Arts & Crafts Houses and Furnishings. The bookplate is in a copy of John Ruskin`s Seven Lamps of Architecture, 6th edition; published by Smith, Elder & Co in 1889, with 14 lithographic plates etched by the author. The seven lamps referred to are sacrifice, truth, beauty, power, life, memory and obedience. What makes this copy rare and desirable is the provenance; it came from the private library of James Morton and is inscribed in his own hand, “Jas Morton, Langdale, Darvel” and dated for April 1901. CFA Voysey of course submitted many textile and carpet designs to the Mortons (which were used). The Bookplates and Badges of CFA Voysey by Karen Livingstone pages 90/91.